Press | Send Down the Basket! Rich Barlow, Two CAS Professors Win Respected Fellowships, BU Today, March 26, 2015. هاملت العربي في… الزعتري؟! Al-Hayat article by Samir Frangie on Hamlet’s Arab Journey and the future of Arab cultural studies (in Arabic). April 27, 2014. Susan Seligson, “New Middle East-North Africa Major Fills Gap at CAS,” On the Middle East and North Africa Studies program I founded. BU Today, May 6, 2014. Interview with Colleen Kennedy on The Shakespeare Standard, posted April 2013. Interview on Pod Academy: a half-hour podcast about my work with Tanjil Rashid. Posted September 13, 2012. Should I include my own writing too? 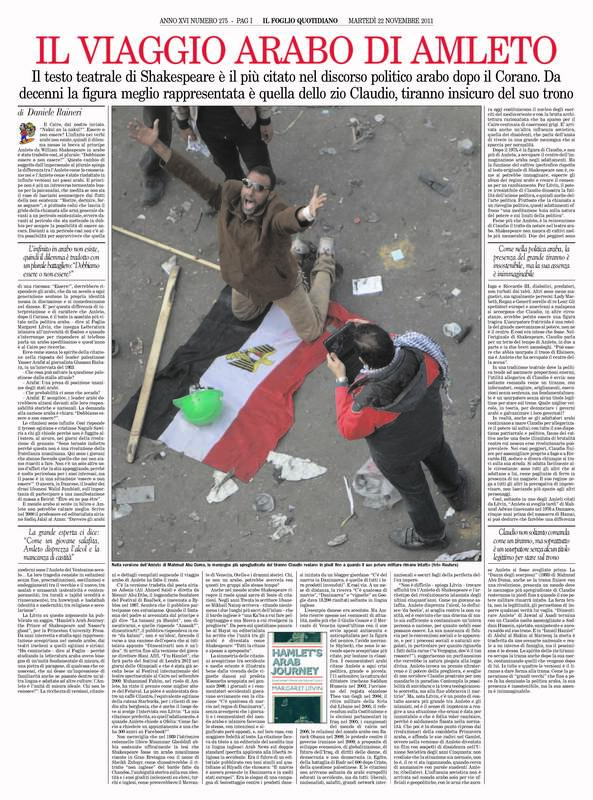 “Not Dead Yet,” Cairo dispatch on n+1, June 21, 2012. For reviews of Hamlet’s Arab Journey, see Margaret Litvin’s Academia.edu page under https://bu.academia.edu/MargaretLitvin/Reviews-of-HAJ. For non-academic reviews and other stuff, see the Hamlet’s Arab Journey Facebook page. Dec 4, 2011. The Guardian/Observer mentions Hamlet’s Arab Journey as an “inspired” study and “quirky” Christmas gift. Nov 26, 2011. Profile by Daniele Raineri (in Italian) in the Rome-based daily Il Foglio. Nov 24, 2011, 10:30pm. Interview with Motaz Elagamy on the “Panorama of the Theatre” program on Egyptian state radio. Didn’t get a recording. It was a little iffy at the Maspero building that night. Winter 2009. Profile by Bari Walsh in Bostonia magazine. Thanks to Vernon Doucette for the awesome photo shoot with the (genuine; borrowed from the College of Fine Arts) human skull!